Updating or purchasing a new kitchen is a big opportunity – and you’ll have a lot of choices to make. You want something high quality that is going to look good and add value to your home when it comes time to sell. 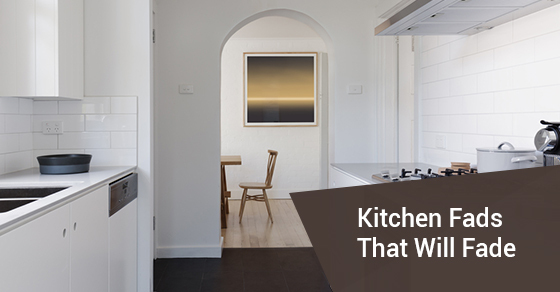 Kitchen trends come and go, but some go faster than others. If you are in the process of designing, decorating or renovating a new kitchen, below are 5 kitchen fads guaranteed to go out of style quickly. Vessel sinks may look chic, but most trend reports indicate that they are definitely not here to stay. The problem with vessel sinks, other than the fact that they often look overly dated, is that they are just not that functional. People are opting for large basin sinks, especially under-mount sinks because they are easier to clean. Most home buyers were prefer the under-mount sink over the vessel sink. Something to keep in mind. Pull out racks, and really anything overly mechanical in the kitchen (including lazy susans and appliance garages) seem to be going out of style. People, especially modern and first time homebuyers in the 21st century, are looking for simple functionality, not a bunch of moving parts. If you think a pull-out rack is going to imply an added level of convenience in your kitchen, just keep in mind that it is not something that most homebuyers are looking for. These backsplashes are likely to quickly be replaced by glass, granite and natural stone. People often go with a solid surface backsplash because it is easier to perfectly match them with the counter. But most homebuying statistics indicate that if you have one of the above backsplashes, and a solid-surface counter top, your house will actually be more attractive to buyers. In the 21st century, people are slowly, but surely moving towards spaces with smaller footprints, both from an environmental, and a design perspective. The days of big, gaudy kitchens seem to be behind us. If you are thinking about a new kitchen, it’s a better idea to invest in newer appliances and higher quality finishings rather than attempting to simply add more square footage onto your kitchen. There are endless ways to get creative and functional when designing your kitchen. Avoid wasting your money on passing trends to ensure your home’s value remains stable and that you’re able to enjoy your home.